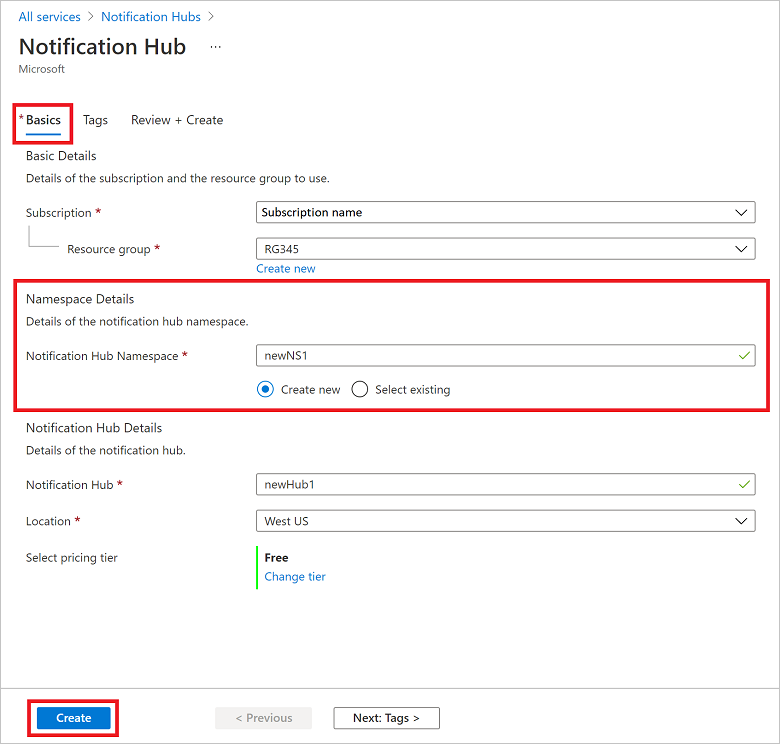 This tutorial shows you how to use Azure Notification Hubs to send push notifications to a Xamarin.Android application. 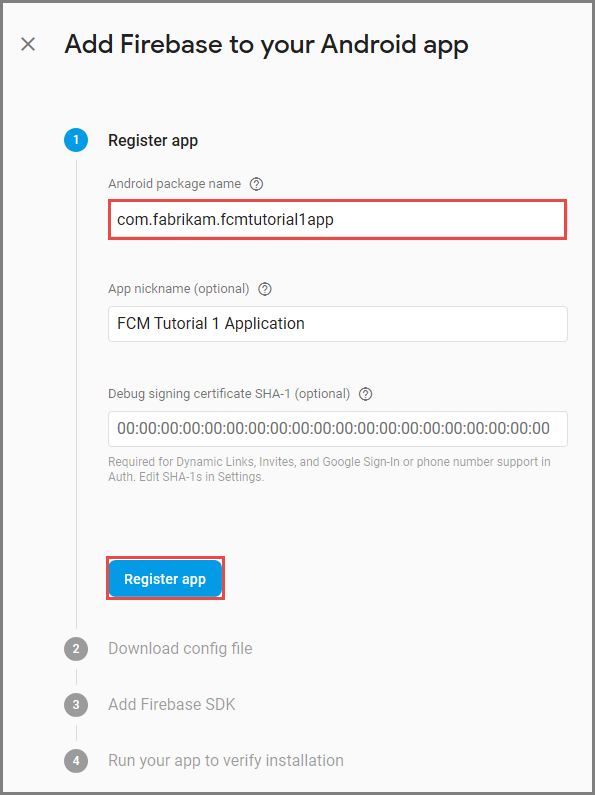 You create a blank Xamarin.Android app that receives push notifications by using Firebase Cloud Messaging (FCM). You use your notification hub to broadcast push notifications to all the devices running your app. The finished code is available in the NotificationHubs app sample. Visual Studio with Xamarin on Windows or Visual Studio for Mac on OS X. For Android package name, enter a name for your package. For example: tutorials.tutoria1.xamarinfcmapp. If you haven't downloaded the google-services.json file, you can do so on this page. Select Google (GCM) in the NOTIFICATION SETTINGS section. Enter the Legacy server key you noted down from the Google Firebase Console. Your notification hub is configured to work with FCM, and you have the connection strings to both register your app to receive notifications and to send push notifications. Expand Installed, Visual C#, and then click Android. 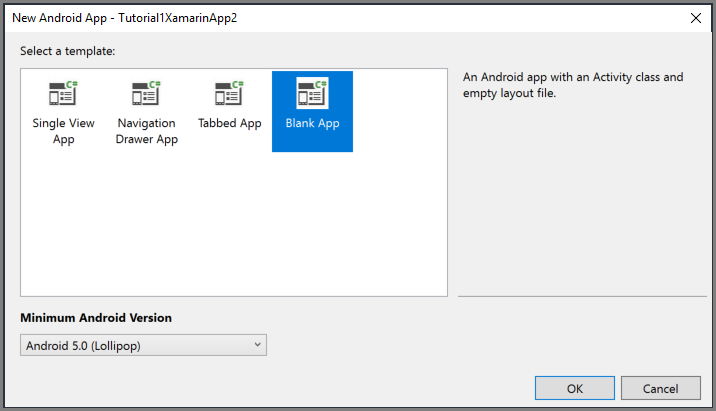 Select Android App (Xamarin) from the list. Select a location for the project. On the New Android App dialog box, select Blank App, and select OK. In the Solution Explorer window, expand Properties, and click AndroidManifest.xml. 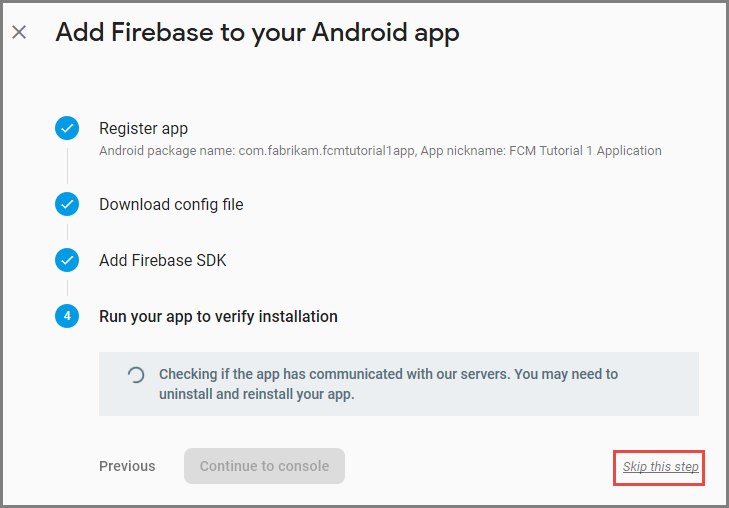 Update the package name to match the package name you entered when adding Firebase Cloud Messaging to your project in the Google Firebase Console. Select the Browse tab. Search for Xamarin.GooglePlayServices.Base. Select Xamarin.GooglePlayServices.Base in the result list. Then, select Install. 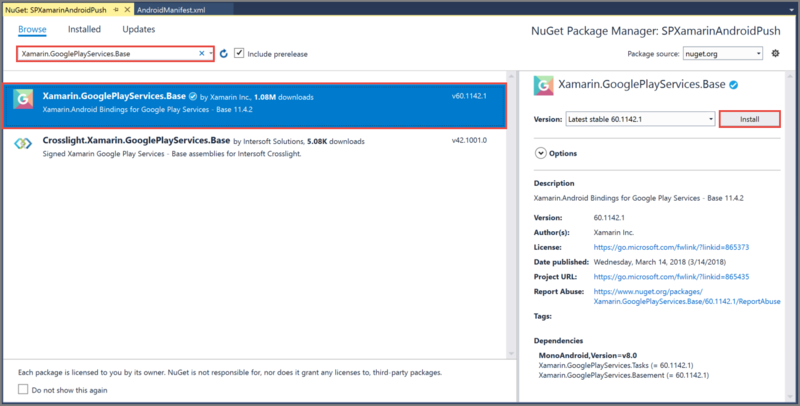 In the NuGet Package Manager window, search for Xamarin.Firebase.Messaging. Select Xamarin.Firebase.Messaging in the result list. Then, select Install. Now, search for Xamarin.Azure.NotificationHubs.Android. 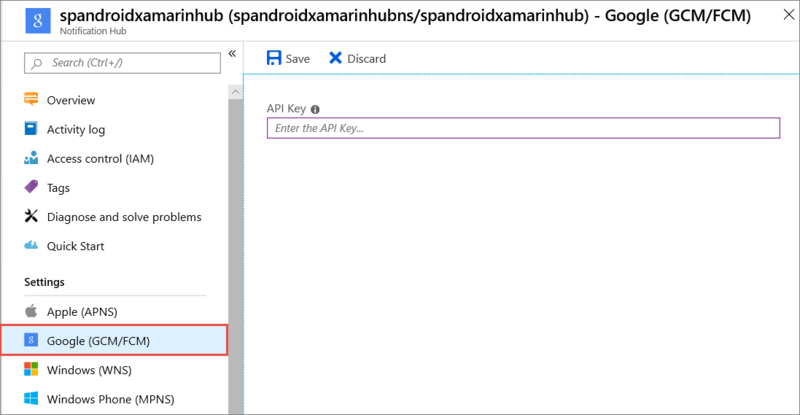 Select Xamarin.Azure.NotificationHubs.Android in the result list. Then, select Install. Copy the google-services.json file that you downloaded from the Google Firebase Console to the project folder. Add google-services.json to the project. 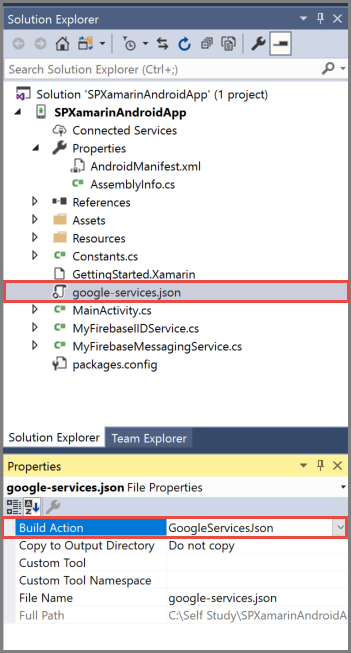 In the Properties pane, set the Build Action to GoogleServicesJson. If you don't see GoogleServicesJson, close Visual Studio, relaunch it, reopen the project, and retry. Add the following statements before the application element. 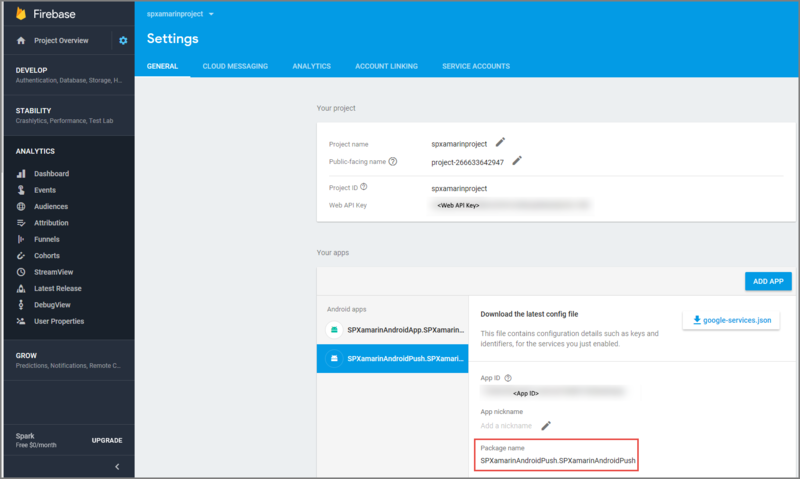 Listen connection string: On the dashboard in the Azure portal, choose View connection strings. Copy the DefaultListenSharedAccessSignature connection string for this value. Hub name: Name of your hub from the Azure portal. For example, mynotificationhub2. In the Solution Explorer window, right-click your project, select Add, and then select Class. 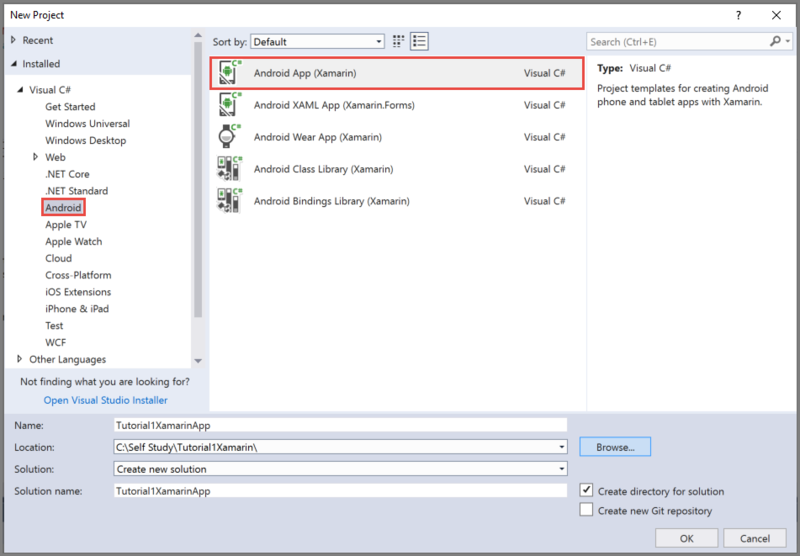 Create a Constants.cs class for your Xamarin project and define the following constant values in the class. Replace the placeholders with your values. Add the following method to the MainActivity class. It checks whether Google Play Services are available on the device. Add the following method to the MainActivity class that creates a notification channel. Create a new class, MyFirebaseIIDService like you created the Constants class. 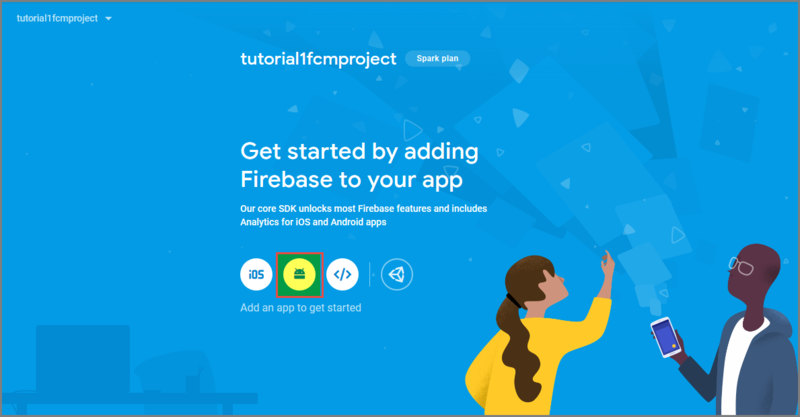 Create another new class for your project, name it MyFirebaseMessagingService. Add the following using statements to MyFirebaseMessagingService.cs. 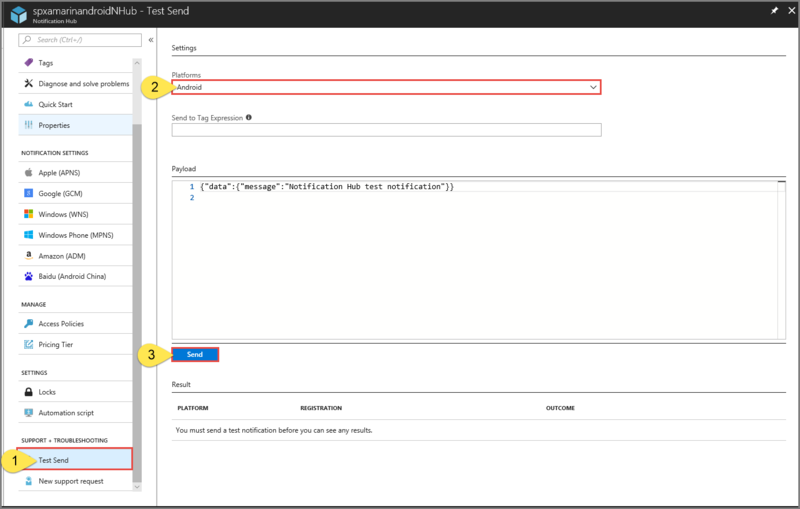 You can test receiving notifications in your app with the Test Send option in the Azure portal. It sends a test push notification to your device. 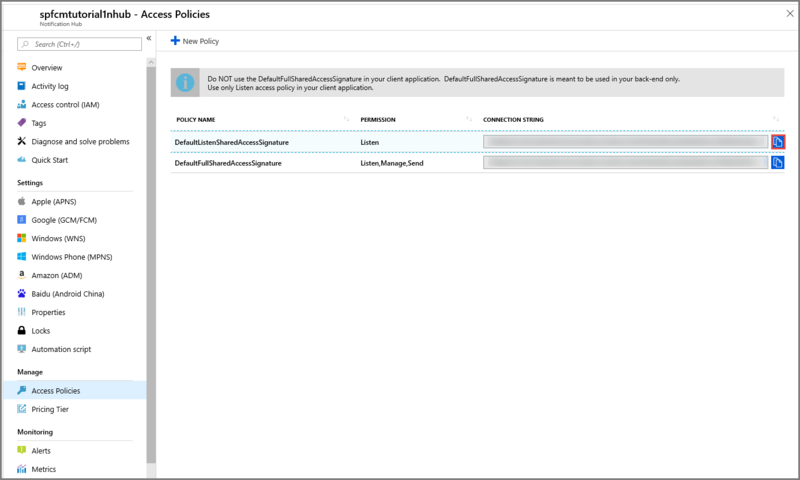 Push notifications are normally sent in a back-end service like Mobile Services or ASP.NET through a compatible library. If a library is not available for your back-end, you can also use the REST API directly to send notification messages.